Barefoot Birth is a birth service company specializing in concierge home birth services with a midwife, personalized prenatal care, doula support, childbirth education, massage therapy, postpartum support, professional birth photography, and acts as a resource for expecting families. Barefoot Birth provides a wide variety of special, personalized services to meet expectant families growing and ever changing needs including home birth services, concierge prenatal care by an experienced midwife, pregnancy, birth, and postpartum doula support, and massage therapy. We will work hard to assist and support you in whichever decisions you make regarding birth and parenthood, and to nurture you and your baby during this beautiful time. Our services are available to families throughout the Tampa Bay Area. Charlie Rae Young, LM, CPM, CLC is a graduate of the Florida School of Traditional Midwifery and Florida Licensed Midwife (MW276). A Florida native, Charlie was called to Midwifery after her own experience with the over-medicalized model of childbirth. She began her service as a doula by founding Barefoot Birth in 2008, and has worked as a strong advocate for better care for families alongside the Coalition for Improving Maternity Services, The Birth Survey, The Florida Council of Licensed Midwifery, and others. She has attended hundreds of births over the last 11 years, filling a niche with naturally-minded families as well as those who are often marginalized from conventional medical care due to social stigma. She has written for and been featured in SQUAT Birth Journal, Tampa Bay Times, Tampa Tribune, FOCUS Magazine, Radical Doula Blog, and been interviewed for the Tampa NBC Affiliate for her community projects The Barefoot Bus--a fully mobile prenatal care unit operating under the easy access model of care as well as her 501c3 The Community Roots Collective. Charlie's belief is that every family deserves safe and quality care, and hopes to continue to build stronger communities through beautiful births. Erica DiBartolo-Barclay, LM is a Licensed Massage Therapist (MA52302) and a Florida Licensed Midwife (MW331). She is a graduate of The Florida School of Traditional Midwifery and Florida Metropolitan University. Erica has always had a love for the human body & innately believes in natural healing modalities since a very young age. Her dream to become a midwife began in 2010 when she gave birth at home to her first daughter. Her experience lead to a passion for safe, balanced & respectful care for all families desiring a more personalized birth experience. During her clinical rotations she was honored to worked with Certified Nurse Midwives and Licensed Midwives in both birth center & home settings. Her youngest daughter was also born at home, attended by Charlie Rae. Erica strives to provide honest care with realistic expectations for our clients and wishes to facilitate family involvement during pregnancy, birth and through the postpartum period! 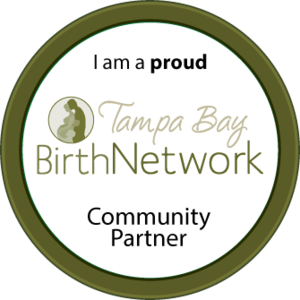 Jenn Bennett Osorio has been involved in the birth community in Tampa for over five years now. Her initial experience was spent working as a birth assistant at a busy birth center where she attended births and taught comprehensive childbirth education. Bennett is also a placenta encapsulation specialist, CAPPA trained childbirth educator, and DONA trained birth doula. Her draw to birth began around the age of four watching her mother and aunt take turns having babies. Unlike other four year olds she wasn’t buying the stork story and was absolutely fascinated with the concept of childbirth. After experiencing her own births she felt called to midwifery practice and began attending midwifery school in 2015 at the Florida School of Traditional Midwifery in Gainesville, Florida. When she’s not in school, or apprenticing she spends her days in a pile of books or out doing “nature-y science stuff” with her three sons and husband. Her mission is to find her way out of said pile of books and to provide the women and families of her community with better birth and prenatal care. Brandi Morales has always been a strong believer in a woman’s power and ability to give birth. When her sister experienced a traumatic birth in 2013 she took that belief a step further and started her path into birth work as a doula. Brandi provides emotional, physical, and educational support for births in and out of the hospital setting and has a special place in her heart for VBAC (Vaginal Birth After Cesarean). Brandi has had the honor to support mothers in their most vulnerable and powerful moments and truly believes that our bodies are not broken! She believes that a positive experience in birth can help ignite a mother's inner strength and confidence that will overflow into motherhood. Brandi regularly attends La Leche League meetings and is working towards becoming a CLC (Certified Lactation Counselor). In addition to doula services Brandi also offers Bengkung belly binding and placenta services. Vanessa Kekuewa has been standing behind the chair as a hairstylist for over 10 years and has recently become trained through Barefoot Birth as a Doula. Vanessa is very excited to pursue birth work as her passion and career path. She is married to her high school sweetheart, has a 2 year old daughter and is expecting a baby boy in January. Vanessa’s inspiration and desire to become involved in birth and maternal work, like many, was brought on by her own birth experience. She has a strong desire to step away from being a day maker with hair to potentially being a life maker supporting and empowering women to rise to their strongest potential through emotional, physical and educational support. Vanessa is currently working on Hypnobabies Hypnobirth certification and is pursuing a Doula certification and lactation specialist training in the next year. Vanessa does not fall short of passion when it comes to supporting women in any way she can.